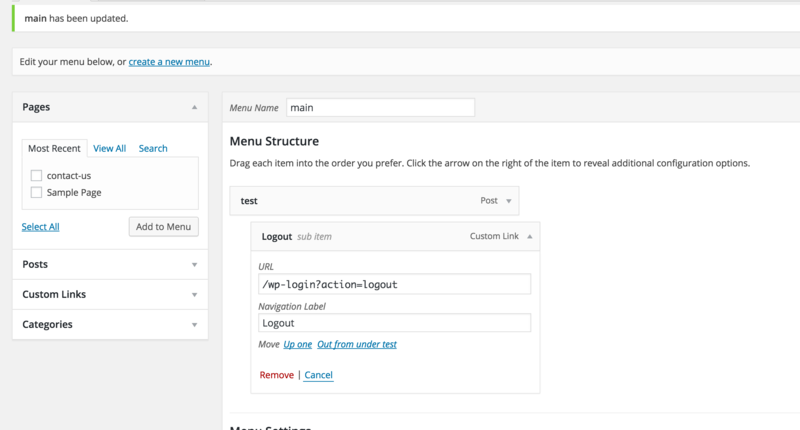 can anyone give me some idea about how I can use the value of wp_logout_url() within the menu creator page of wordpress? As the menu creation page doesn't support php I cannot just put echo wp_logout_url( home_url() ) under custom link. because it doesn't fit my need, I have to add the logout link as a dropdown menu not as parent menu and also will show up in certain pages only. I can hel these things if anyone can show me the way how to fetch the wp_logout_url() data within the wp menu creation page. Here is what I did to get rid of this issue and I think while solving this issue, I got an idea to fix all similar issues. I downloaded an amazing plugin called Shortcodes in Menus. Voila! Problem solved, and crazy simple to do. Not the answer you're looking for? Browse other questions tagged menus dashboard logout or ask your own question.